Spanish Translation for Excavate! MesoAmerica Game Free This Month! While the Aztecs, Incas and Mayan did not celebrate Cinco de Mayo, it’s still a great day to learn about MesoAmerican history! Our Excavate! MesoAmerica social studies game updated recently to include a Spanish translation. This new version features the same great gameplay as the English-language version. However, the translation opens this archaeology adventure up to more students across the country and world. With the option to switch back and forth between languages, the game also works well in teaching reading comprehension for both English and Spanish. The game runs on the web, Android devices, and iOS devices and can be bought for $3.99. However, for the month of May, get the game for free to celebrate this new translation! 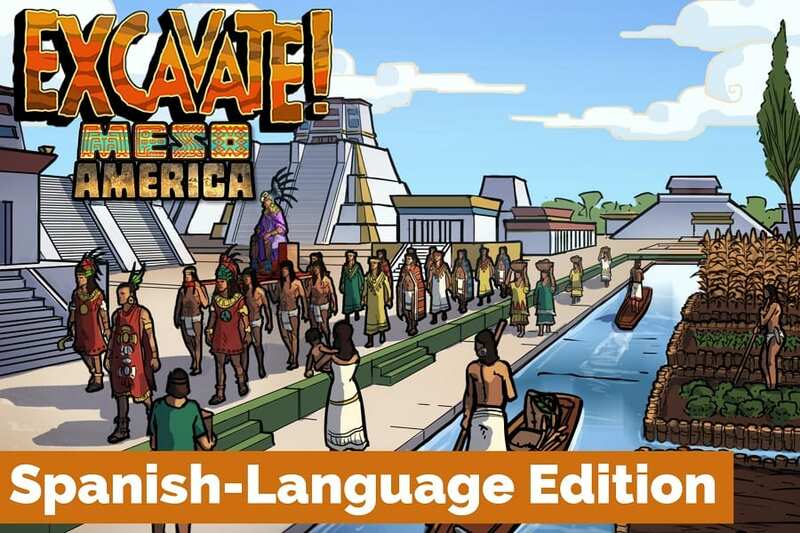 By supporting a Spanish translation of the MesoAmerica edition, we hope that more classrooms can experience our biggest game based learning series. With a Spanish translation, the game fits into Spanish immersion schools, language classes, and more! Since we aim for our educational tools to be available to as many different students as possible, we hope the translation opens the doors for more students to experience Excavate! MesoAmerica. In Excavate! MesoAmerica, students analyze three significant locations tied to the Aztec, Inca, and Maya cultures. As journals record their progress, students progress through three sites tied to Inca, Aztec, and Maya culture. At each location, students make meaning of how artifacts were used through a series of analysis questions and reports. By completing these tasks, students make connections and deduce facts about the people who lived, worked and played there. In this way, you consider the historical context of the primary source artifacts and make connections. During the game, players learn about the significance of jade and obsidian for the Maya, distinguish the role of gods in Incan society, and gain perspective on Aztec engineering. The Excavate! games are designed by former middle school teacher and DIG-IT! Games CEO Suzi Wilczynski. Through engaging gameplay and challenging analysis, the series takes students on entertaining and educational archaeological adventures through tim. Using archaeologists’ tools, players uncover real artifacts from ancient cultures. Also, each civilization includes 3D artifacts and detailed illustrations of ancient life to immerse the user in each unique culture. These educational games fit into grades 3-8 and correlate to Common Core State Standards (and equivalents) for ELA and The National Council for Social Studies C3 Framework. For easier analysis, the game includes the new educational game and app learning analytics standard GBLxAPI, which is improving learning data reporting in educational games and applications. Also, the Excavate! Games recently received high marks from the KOKOA evaluation method. Now, take the chance to grab Excavate! MesoAmerica for your classroom while it’s free this month! Spanish Playground: Spanish for kids! This website features all kinds of activities for every aspect of learning the language. Espanglish: For those in the DC area, meet up with other adults learning Spanish!